The article deals with the ideological construction and the popular and commercial usages of the “Thracian heritage” in Bulgaria. The promotion of the ancient Thracian spirituality as an archetype of the Bulgarian culture was made possible by the nationalistic policies of the Bulgarian communist regime. The main subject of analysis here is the particular field of research named thracology, or Thracian studies, that was launched throughout the same period. The article tries to show that thracology has absorbed an anachronistic conceptual framework that makes it look like a methodological rudiment from the 19th century. This field of study shaped popular perceptions that are today expressed on websites, in amateur writings and in the touristic commodification of the Thracian heritage. The article argues that these phenomena cannot be properly understood as popular or commercial exploitation of an ‘authentic’ heritage as the latter is itself a product of a problematical scholarly construction. The paper explores the processes of intensive canon formation in the Bulgarian literature after World War I through the perspective of the literary anthologies. Being an individual artistic gesture in the prewar period, later, in the postwar situation, anthology becomes an instrument of state cultural politics and institutional power. In 1922, the Ministry of Education commissions and sponsors a national poetry anthology which is examined in detail in the text. On the background of the various literary fractions competing for the symbolic capital of the youth in the literary field of the early 1920s, the State turns out to be a mediocre anthologist undermining its own strategies for canon formation. This paper problematizes the contradictory discourse of national identity in post-Soviet Ukraine which is framed by two essential factors: on the one hand institutional isomorphism of Soviet structures, on the other hand heterogeneity of the symbolic space, plurality of memories and narratives. We analyze the model of “strategic relativism” as an informal government strategy and demonstrate its structural weaknesses, which contributed to full-scale identity politicization in the “Orange Revolution” and the subsequent attempts to intensify identity politics. The consequences of these successions of events are interpreted as decisive for future attempts to instrumentalize identity categories in view of the high political costs of “constructing” identity politics and efficiency of “electoral” identity politics. Modern school education is often regarded as a mere (ideological) function of the general state strategies aiming at producing and reproducing a certain socio-political order. Civic education is thus analyzed as an almost mechanical translation of state policy towards production of civic consciousness through educational programs. The present article offers a different way of analyzing this process by focusing on education as a tactical interaction in the particular situation of the contemporary Bulgarian school. It stresses the inherent uncertainty of power relations between teacher and students by privileging the teachers’ point of view. The school is therefore described as a field of polemical interactions in which the usual power positions are constantly contested and redistributed by reason of a multiplicity of internal and external factors evoked by the teachers themselves. As a consequence the latter are transforming their ‘pedagogical’ practice in tactics of intellectual bricolage in order to ‘capture’ the students’ ‘interest’ and by this to maintain the ‘discipline’ in the classroom – an indispensable but somehow unachievable basis for the education process. A point is made that it is on these polemical bases that nowadays civic education programs and practices struggle to embed. However they are by necessity traversed by the same tensions that constitute the form of educational interaction. The text explores the impact of early Bulgarian press on the geographical imagination of the audience (from the first newspaper in 1842 until the end of the period of Ottoman rule in 1878). The study is focused on newsflow geography analyzing it as a specific mechanism to map the space through mediated information about local events. Special attention is given to points of intersection and difference between the territorial project of the Bulgarian national elite and the newsflow mapping of homeland and abroad. The latter was marked by relatively low level of ideological control as the correspondents were amateurs sending information of their own free will and from places of their own choice. Their mediated narratives resulted in imagined geography representing the homeland not as a compact territory but as dynamic net of places combined in fragmented mosaic structure. The paper presents the results of a study focusing on the interviews with the main contenders for mayor of Sofia published in national dailies during the election campaigns in 2007 and 2011. The analysis is trying to verify the hypothesis that in Sofia mayoral election campaigns, the contenders exploit the national discourse, focusing on ‘Sofia, the capital of the nation-state’, and promote themselves as defenders of the national interest which is claimed to be defended ‘solely’ by the political force to which they belong. The presumptions are that they easily resort to this figure, avoiding the significantly more complicated position on Sofia as a big city, a position that presupposes greater expert/governmental knowledge; and that the national is assumed to be a more reliable and easy resource for mobilizing voters who, in addition to everything else, tend to identify themselves more as residents of the capital city (stolichani) than as Sofianites (sofiyantsi). Here I present a successful example of citizen action, mobilized by a local urban social conflict. I analyze how the action group constitutes itself, organizes and achieves success in influencing municipal policy. This study lends concreteness to the notion of “civil society“ that in Bulgaria is still seen largely as an abstract ideal. It counters the widely-held idea that here policy-making is beyond the reach of the common citizen and that Bulgarian society is not yet able to mobilize for defending its rights and interests. My argument here is that the most powerful weapon that civil society can use is its mastery on shaping public discourse. The text traces the relationship between media and nationalism before and after Bulgaria’s accession to the EU on 1 January 2007. The analysis is focused on several main tendencies. Many state institutions produced an officialized version of ‘modern nationalism’ promoting it as a top priority politics. The state, however, was not able to retain its leading position in the formation of national identity. On the one hand, the boom of social media and networks encouraged nationalist self-organization on the internet. On the other hand, advertizing, popular culture and sports were gradually turning national identity into a commercial product of the cultural industry. Special attention is given to the hidden similarities between ‘high’ official identity discourse and its reworked versions in the sphere of popular culture. 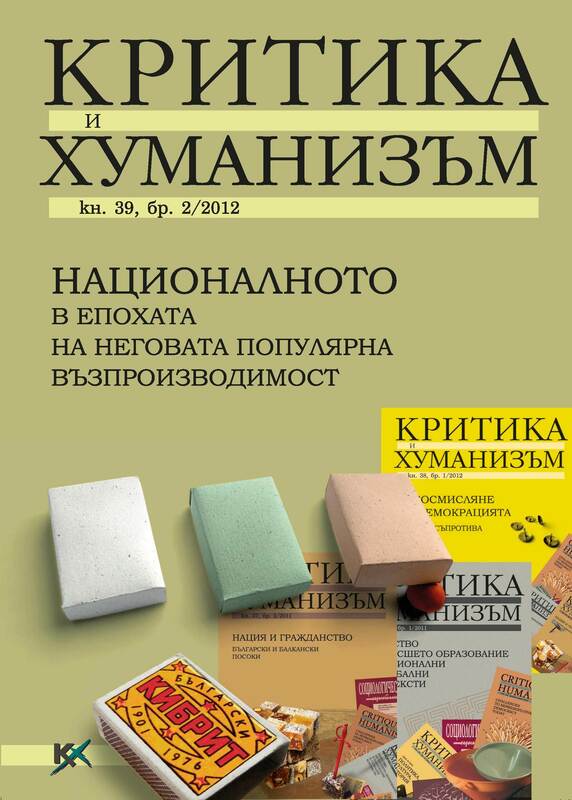 The article examines the social lives of the Star Wars film trilogy by George Lucas in socialist Bulgaria. In so doing, the purpose is to contribute to the writing of the history of Bulgarian socialism. Considering both state repertoire policies and viewers experiences indeed leads us to offer a complex image of East-West cultural exchanges during the Cold War that goes beyond the alternative between Eastern “opposition” to and/or “imitation” of the West. More specifically, I argue first that, although Bulgarian and Soviet movies were given priority in cinematic repertoire, from the 1960s onwards the growing pursuit of profitability, the desire to fulfil the tastes of a diversified audience and the longing for international recognition favored the selective import of Western Sci-fi movies. The release of Star Wars mirrors those choices. Second, the decoding of Western feature films by Bulgarian audiences cannot be reduced to a mere political act of resistance, a reading “in between the lines”. The popular success of the Star Wars has to be interpreted in relation to the popularity of a science fiction genre, whose historical and geographic developments did not espouse the spatial and temporal cleavages of the Cold War. Finally, if for some audiences fascination with Star Wars was part and parcel of their search for an alternative utopia, others still were engaged in a metaphysical quest for meaning that approached science (fiction) through its mysteries. The article attempts to analyze how the national identity is contested and re-interpreted by the “ordinary people” in Certeau’s terms. It starts from a paradox, identified by the social sciences – the trend of diminishing identification with the political community and the state on one hand and the growing popularity of the nationalistic discourses, on the other. The text uses as a case study the public debates on the Turkish soap operas. Interpreting how different actors use popular repertoires, the article argues that “the national” functions as a discourse at hand to conceal the fragmentation of the political community and to block the construction of new narratives of a collective future. The text compares the contemporary sub-cultural nationalism that we observe around sport events, internet quarrels or popular music with its political predecessor of the last two centuries. Today passions are much more centrifugal, mass mobilizations dissolving as quickly as they have emerged without producing leaders, platforms or consequential ideologies. One of the reasons seems to be the new media context of overproduction, where only new, radical and negative messages are heard. The other reason lies in a profound change within commercialized culture: the nation no longer owns its member; it is the fan who feels entitled to own the nation with all its emblems, myths and emotional experiences. The paper is focused on media campaign initiated by bTV “Let’s clean up Bulgaria for one day!” which is a part of the global initiative “Let’s Do it World”. It examines discursive figures which constitute citizen action and through which a certain social and political order is described. What kind of agency is produced within ecological discourse and how these forms of subjectification reassemble a collective? What does the campaign tell us about the political state of Bulgarian society? The article tries to make understandable the way the garbage as materiality participates in the construction of social relation in the context of nationalism. The sensation of shame and disgust associated with dirt and waste are central, as they enter into a direct relationship with nationalist feelings. It is through that connection that a specific motivation is created, orientated towards the reactualization of commercial causes. What is striking in the analyzed materials, is the specific actualization of cleaning related discourses from communist times, but that time completely privatized by one media and used for commercial purposes, in which cleaning the national territory represents what we know from French, a supplément d’âme. This article deals with the problems of ethnicity-based conflicts in the Bulgarian society and their reflections and recurrences in the virtual space. By putting the local issues at hand in a broader context and referring to studies and research carried out in other countries, the author aims to distinguish the margins of cyber-activism in Bulgarian virtual space and to make an approach of mapping the ethnical structure of this space. The main actors, which are of interest for this study, are far-right activists, Bulgarian Turkish and Roma population. Analyzing the supposed tension between “nationalists” and “minorities” in virtual space, the author comes to a conclusion that ethnicity-based struggles appear to be a phenomenon of very limited significance in the local web. However the article emphasizes on other hand major problems, which are closely related to this impossibility of the virtual space to become a field for ethnicity-based struggle. On the one hand we observe the continuing tendency of Roma and Turkish population to be largely excluded from the web, based on material and educational factors. On the other hand the far-right activists demonstrate low levels of trust in the independent character of virtual space as a media. Both of these issues are of vital importance for anyone who is interested in analyzing the structure of Bulgarian virtual space and its limitations, corresponding to social problems exceeding its margins.